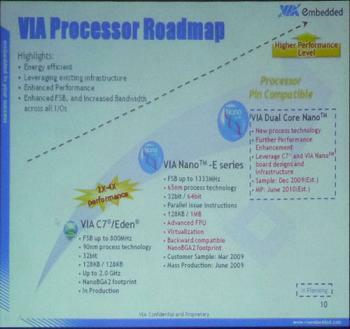 VIA Technologies, a fab-less processor manufacturer has just shared its latest product roadmap during the recent Embedded Technology 2008 held in Japan. The roadmap disclosed a series of VIA’s Nano processors that are intended to be released in two years time, competing against Intel famous Atom families in ultra low power and small form factor market segments. From the presentation foils, it shows Nano E-series that will start sampling by March 2009 and mass production in June 2009. It will be followed by VIA Dual Core Nano sample availability by end of 2009 and mass production by June 2010. While it seems to be late to market after Intel Atom being launched since half a year ago, but there are some great features that have been included in order to gain back some market shares. For instance, Nano E-series will be featured with FSB (Front Side Bus) clocking at 1333MHz, which is significant higher than both Intel Atom Z and N-series processor at only 533MHz. However, the 65-nm process technology will hold it back in terms of much larger foot print as compared to 45-nm process technology being used to fabricate Intel Atom processor. Hopefully Dual Core Nano may able to have a process die shrunk to 45-nm even though it was not clearly (only mentioned new process technology) indicated in the chart. Good thing is, VIA Technologies always ensures a seamless platform transition by guaranteeing system backward compatibility with even its current generation C7/Eden platform so that existing VIA’s customers don’t have to spend much effort in terms of system upgrade and migration.